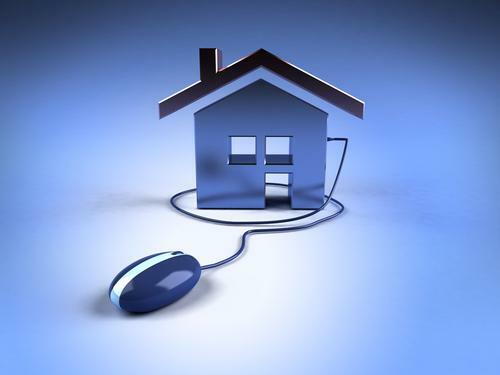 Why are clients dissatisfied with online real estate interactions? This post was written by Jonathan Aizen, the founder and CEO of Amitree. Contact Jonathan via his website or follow him on Twitter for more insights on the intersection of real estate and tech. Last year, PR firm Weber-Shandwick and consumer opinion research firm KRC Research did a study on consumer satisfaction with the online experience of various industries. Not surprisingly, health care, government services and insurance all ranked in the bottom quartile (and this was even before healthcare.gov launched). What ranked lower? Real estate. 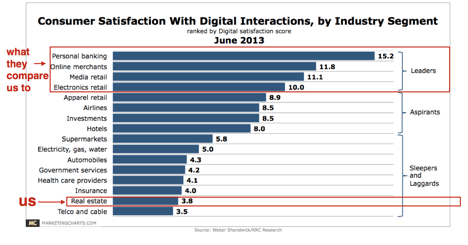 Yep, consumers’ digital interactions with the real estate industry ranked just above dead last. Why? I actually think the answer has less to do with the real estate industry’s effort to build better tools and experiences, and more to do with the changing expectations consumers have of what the Internet can do for them. We now live in a world where consumers can click on an app to make any household item magically appear on their doorstep within 24 hours — yet most of them have to go find a fax machine when it comes time to make an offer on a house. Clearly it’s an unfair comparison — the legal complexities of buying property make it more difficult for consumers to “Google their way” through what amounts to the most important purchase of their life. But to write this off is to ignore the largest opportunity you have to delight consumers and get them to refer more business to you. Tech companies have responded: For the first time, it’s not that difficult to significantly improve the consumer’s experience with buying or selling a house using technology. You can share listings and collaborate on search with tools like Buyfolio. You can help your buyers understand which location makes the most sense for them with Walk Score. But even more opportunity for customer satisfaction exists once the offer is made and the buyer goes into contract. Tools like DocuSign, dotloop and other paperless systems have made tremendous headway in empowering you to make your customers happier. And while my viewpoint is biased on this, there’s even more opportunity to de-stress and delight your customer as they navigate the complex process of getting all their tasks done as they move toward closing (each and every one of you could probably tell me a story of a closing gone off-track due to a buyer or seller not understanding the process correctly). Let’s not let that chart discourage us. Just because the process is complex and no Internet tool will ever replace the wisdom, years of experience and critical insight of the people in this “people business,” the little changes and improvements you can make will be received as giant leaps in improving your customer’s experience. Don’t fall into the trap of thinking that everything you use has to work for 100 percent of your customers, or has to integrate fully into everything else you use. Using technology to grow your business is often about building a tool kit so you have options that work for every situation. The bottom line is that by delivering these tools to your buyer, they come to associate the great experience they have with you and your brand. Each experience you deliver to your customers begets more referrals and more business, all without much additional work. How do you think customer satisfaction with the “digital” experience of real estate is going to improve? Which tools do you use to delight your customers? Share in the comments below so others can learn.